I’ve been a buffalo chicken wing freak ever since the days of The Airways Hotel in Buffalo, NY. Seems they stumbled upon a hot wing sauce by accident and the rest is history. Chances are, if you don’t reside in Colorado, you probably haven’t heard of the Captain Sponge foot Trading Company. Their sauces have been handcrafted there, since 1995. Shame on this company for not marketing and targeting the rest of the country. Their Original-Wing Sauce is as good as a wing sauce can be! With a little marketing, their products could be everywhere and trust me, they would sell. Lets take a look at packaging. Their 2 bottle Colorado gift pack consists of a 5 oz. bottle of Chipotle-Table Sauce and a 5 oz. bottle of Original-Wing Sauce. Notice how the “CO” (Chipotle and Original) on the labeling stands for Colorado. Coincidence? I doubt it. The labeling is extremely good, in fact, has won several awards. After a little research, we learn that this gift set won 1st place in the Scovie Awards for full product packaging and 3rd place for product label for the Chipotle-Table Sauce. (I will review this sauce at a later date). Both awards were in 2005. Very impressive labels. Good quality, non-gimmicky and all around just plain good. Captain Sponge Foot’s motto is “fry or bake, sauce and shake”. Ingredients: Cayenne Pepper, Sriracha Pepper, Chipotle Pepper, Water, Vinegar, Clarified Butter, Salt, Sugar, Garlic, Natural Flavors and Spices, Corn Starch. I really like this line up of ingredients. My first aroma after opening this sauce up was from the smoked Jalepeno’s or Chipotle peppers. Smokey, with a hint of garlic (probably from the Srirachi pepper). I found that Srirachi is actually thai chilies mixed with garlic and sugar. It is named after Sriracha Harbor, the largest private port on the Eastern Coast of Thailand, not far from Bangkok. I did notice a hint of tang, but not really from vinegar. It was mild and mellow. Using Clarified Butter in the ingredients is brilliant. Clarified Butter doesn’t burn easily and really adds sweetness and texture. I prefer to very lightly dust my wings with flour, but it would not be necessary with The Original-Wing Sauce. The consistancy is quite good and would stick without any cooking medium. As you can see, the appearance of The Original-Wing Sauce is a deep red, with bits and pieces of peppers visible. I get a feeling that there is some tomato in this sauce but it is not listed. The texture is perfect. I’ve added just 1/2 tablespoon of real butter to the sauce and once the wings were done, tossed them in the sauce and served them with celery and blue cheese dressing. Folks, I’ve got to tell you. 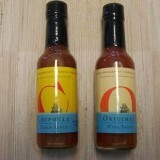 Captain Sponge Foot Trading Company has a great Original-Wing Sauce. The taste is better than the original Airways Buffalo Wings. Spicy heat, about a 6 on my scale and true chipotle flavor with garlic and some sweetness. It is all there. Come on Captain Sponge Foot, take your Original-Wing Sauce and set sail farther East. We need ya. Captain Sponge Foot Trading Company, Inc.
Nice Review Steve! Those wings look amazing! I second that, those wings look so tasty. After you deep fried them then you just slathered with sauce? We have a pot of gumbo to eat up but I think on Thursday the forecast calls for wings. Hey, if sriracha is an ingredient and it is made up of more than one component it needs to list all parts of the whole. In descending order it needs to list out chiles, sugar, garlic and any other ingredients. Great review, I will have to try these sauces. Those wings sure do look yummy but can I ask why you added more butter to the sauce before coating the wings in it? You mentioned the sauce has clarified butter in the inredients already. Do you just LOVE butter? Do you have a butter addiction??? lol Or did the sauce need it? Kristi, don’t badger the boy over a bit of butter. Bet if you took a big bite of one of them buttered buffalo wings you’d bolt to the store down the block in a bit and and buy yourself a big old bottle!? Geeez, never heard of a butter fetish? Where you been? Actually, the sauce did not need any more butter. I take all the pics, then do the review. The pics were done two weeks ago and I completed the review just a few days ago. I ended up using all the sauce so I couldn’t go back and have a do over. My bad. Not badgering, actually quite the opposite. Being a HUGE fan of the old artery clogging butter myself, I was merely curious as to whether or not the sauce really needed it or if he was just a bit of a glutton like myself! Do you churn your own? Why didn’t my smilie work? What the………..
Nothin bad about it, was a great review Steve, I’m still hungry and I read the review hours ago. Kristi, it’s ok if you do. Statistics say that 85% of all women churn their own butter and the other 15% are lying about it. The humanity of it all! LOL!